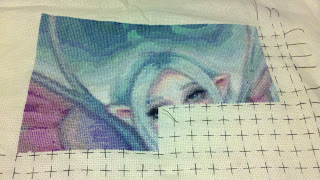 So I'm a little late to post my update for the IHSW (International Hermit and Stitch Weekend) but I'm making up for it by posting a little early for the February TUSAL! That should even things in the balance, right? And my early TUSAL for Febuary! 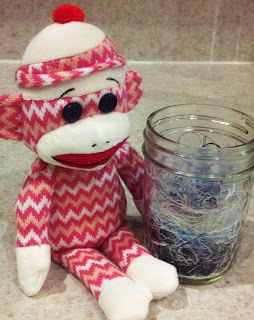 Sitting with my Valentine Sock Monkey :) I layered on top of what I completed for January....but I'm thinking I'll transfer these to a larger container and start fresh for the next update! Hope everyone had a great weekend (maybe a longer one for anyone that had Pres' day off too!) Tomorrow I'll be catching up on everyone's IHSW updates and new TUSAL pics!! Though this is a quick update post....I can't contain my excitement for having won 2 blog contests!! I've never won anything online before, so I'm soooooo excited! I'll share more info with pictures in my next post!! Now I have a new piece I'll be adding to my WIPocalpyse!! Looks great, lesli! You've done a ton! You have made great progress. Coral looks great as does your TUSAL. Congratulations on winning a giveaway and on the amount of stitches you have got in. Congratulations on your give away win. Coral is coming on beautifully, and your ORT jar is very pretty with Coral's colours in it. Beautiful progress on Coral. She is gorgeous. Love your TUSAL update. The sock monkey is too cute. Coral looks great! And congrats on the 2 blog wins! Wow! You got loads done!!!! Congrats on winning two contests!!! coral is looking so lovely..
congratulations for the blog win.. 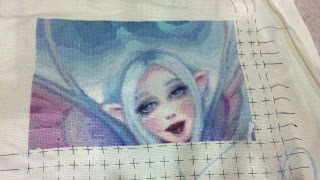 Fantastic progress on Coral! Wow! The sock monkey looks great, posing with your TUSAL jar. Congrats on winning 2 blog contests. Looking forward to seeing your prizes! And congrats on your wins!! Coral looks so beautiful. Love the colours. Coral looks fantastic - and you got so much done! Congrats on the wins too. Just had a quick nosey at your quilt, it's amazing! Lovely progress. I like the stitching jar. You could dump it or get something and tamp it down. Lots of orts added to your TUSAL jar. LOVE that sock monkey!